These aluminium folding windows use the same tried and trusted system that we use for our excellent continental folding doors. With widths up to 6 metres, when open they can leave around a 90% clear opening. There are lots of opening styles such as all panels folding one way, some folding one way and the rest sliding the other. Our aluminium bi-folding windows smoothly glide open - creating a 90% opening for entertaining and bringing the outside in. Makes for a very stylish serving hatch for garden parties and BBQ's. We are able to produce these windows in many different configurations. Our folding windows can open into the room or outwards. Depending on the width of your opening our bifolds come with between 2 and 6 panels, with each folding panel being up to 1 metre in width. Direct fix slim-line 70mm profile to help maximise solar gain. Very slim meeting stiles of just 140mm, No floating mullions - The leaf is just 64mm. Runs on 4 stainless steel bogey wheels on a dual track, ensuring graceful operation. OPEN INSIDE or OPEN OUTSIDE the building. 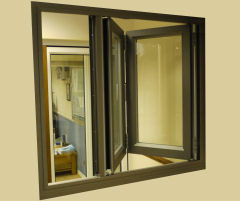 Sliding folding window system - perfect for wide openings. Superior Polyamide thermal break - the latest thermal break technology. 28mm internally glazed sealed units, for increased security. Locking on main sash and shoot bolts top and bottom of the intermediate stiles. Discreet, 'funky' flush line pop-out T-handle, allows tightest possible stacking and beautiful aesthetics. The structural strength and durability of aluminium. Profile exactly matches our Continental Folding Doors. All windows are made to measure - we do not have standard sizes. Integral blinds within the sealed units. Single or Dual colour options available. Slides left or right on openings. 2, 3, 4, 5 & 6 Panels with various opening options. Single or double traffic window on either side (double window only on 4 and 6 panel).